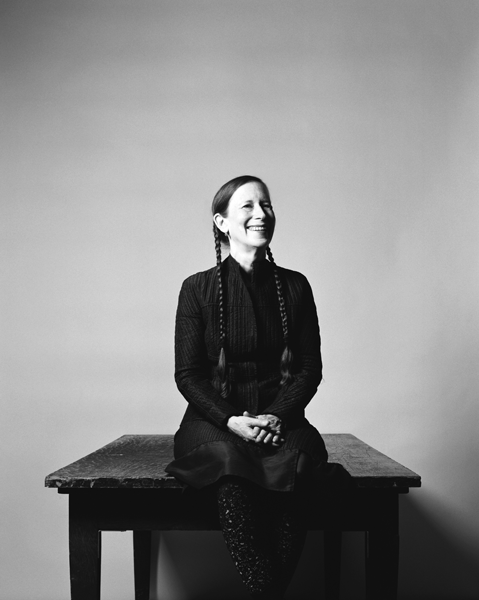 The music of 2009 Grammy Award nominated Meredith Monk will fill two New York museums in the coming months. First, the Whitney Museum of American Art is hosting Meredith Monk Music at the Whitney on February 1, where Monk and her musicians and vocalists take over the third floor galleries to present four hours of music and film dating back to 1966. On March 5, the Guggenheim Museum will host the New York premiere of “Ascension Variations,” a site-specific version of Monk’s most recent work, “Songs of Ascension.” Monk’s radical transformation of the Guggenheim rotunda and galleries recalls “Juice,” the history-making work that the composer, choreographer and multi-disciplinary artist created for the Guggenheim in 1969. ABOUT THE WHITNEY: Highlights from forty-three years of Meredith Monk’s breakthrough music––ranging from the 1966 original film “16 Millimeter Earrings” to her haunting and witty “Songs of Ascension” (2008)—comprise the four-hour celebration of her work. The afternoon also includes selections from “Raw Recital,” which was premiered at the Whitney in 1970; “Stringsongs,” a 2004 commission from the Kronos Quartet, which marks Monk’s first string quartet; music from “ATLAS,” an opera commissioned by the Houston Grand Opera where it premiered in 1991. Add to that a series of instrumental pieces including “Gotham Lullaby” (1974), ”Tablet” (1976), “Lonely Spirit” (1991) and “Double Fiesta” (1986). Four voices will accompany Rick Moody’s reading of his story “Boys” which was originally composed for and heard on The Next Big Thing on NPR. ABOUT THE GUGGENHEIM: The snail-like spiraling galleries of the Guggenheim Museum will be magically transformed by “Ascension Variations,” Monk’s adaptation of her most recent work, “Songs of Ascension,” to the Guggenheim’s unique geometry. The work was inspired by Monk’s fascination with the symbols of ascension and circling that are integral to most spiritual practices, both religious and secular. For “Songs of Ascension,” Monk composed movement and sound that is constantly shifting and changing, evolving and expanding. The work radiates with Monk’s singular wit, humanity and physicality. In addition to voice, Monk’s luminous score includes a string quartet (led by Todd Reynolds), winds and percussion. The costumes are by Yoshio Yabara and the lighting design by Tony Giovanetti. “Ascension” was previewed at the Walker Art Center in Minneapolis this past June, followed in October and November by performances in California at the Ann Hamilton Tower at the Oliver Ranch in Sonoma County, Stanford University in Palo Alto and the Redcat in Los Angeles. To celebrate her original work at the Guggenheim, Monk will intersperse bits of “Juice” into the performance. “Ascension Variations” is part of the Guggenheim’s The Third Mind Live, a series that features world-renowned practitioners in dance, music, performance art and theater. The series is presented in conjunction with the exhibition The Third Mind: American Artists Contemplate Asia, 1860–1989 on view at the Guggenheim Museum through April 19. Tickets to Meredith Monk Music at the Whitney on February 1 are free with Museum admission and available on first come first served basis. There are no reservations. The afternoon begins at 2pm. “Ascension Variations” will be performed at the Guggenheim at 6:30pm and 9pm on March 5. Tickets are $50 for adults, $40 for members and $20 for students, and can be purchased online at guggenheim.org or by calling the Box Office at 212-423-3587 between 1pm and 5pm. ABOUT MEREDITH MONK: Meredith Monk is a composer, singer, director/choreographer and creator of new opera, music theater works, films and installations. A pioneer in what is now called “extended vocal technique” and “interdisciplinary performance,” Monk creates works that thrive at the intersection of music and movement, image and object, light and sound in an effort to discover and weave together new modes of perception. Her groundbreaking exploration of the voice as an instrument, as an eloquent language in and of itself, expands the boundaries of musical composition, creating landscapes of sound that unearth feelings, energies, and memories for which we have no words. She has alternately been proclaimed as a “magician of the voice” and “one of America’s coolest composers.” During a career that spans more than 40 years she has been acclaimed by audiences and critics as a major creative force in the performing arts. Since graduating Sarah Lawrence College in 1964, Monk has received numerous awards including the prestigious MacArthur “Genius” Award in 1995, two Guggenheim Fellowships, a Brandeis Creative Arts Award, three “Obies” (including an award for Sustained Achievement), two Villager Awards, two “Bessie” awards for Sustained Creative Achievement, the 1986 National Music Theatre Award, the 1992 Dance Magazine Award, and a 2005 ASCAP Concert Music Award. In 2006 she was inducted into the American Academy of Arts and Sciences and named a United States Artists Fellow. In 2007 she received the Demetrio Stratos International Award for musical experimentation, and in 2008, the premio Arlecchino d’Oro from the Mantova Festival in Italy. Monk holds honorary Doctor of Arts degrees from Bard College, the University of the Arts, The Juilliard School, the San Francisco Art Institute and the Boston Conservatory. Her recordings Dolmen Music (ECM New Series) and Our Lady of Late: The Vanguard Tapes (Wergo) were honored with the German Critics Prize for Best Records of 1981 and 1986. Her music has been heard in numerous films, including La Nouvelle Vague by Jean-Luc Godard and The Big Lebowski by Joel and Ethan Coen. In 2000, Monk began a publishing relationship with Boosey & Hawkes. Several of her scores, including her recently released Piano Album, are now available to the general public. In 1968 Ms. Monk founded The House, a company dedicated to an interdisciplinary approach to performance. In 1978 she formed Meredith Monk & Vocal Ensemble to expand her musical textures and forms. She has made more than a dozen recordings, most of which are on the ECM New Series label. Her music has been performed by numerous soloists and groups including The Chorus of the San Francisco Symphony, Musica Sacra, The Pacific Mozart Ensemble, Double Edge, Björk, and Bang On A Can All-Stars, among others. Monk is a pioneer in site-specific performance, creating works such as Juice: A Theater Cantata In 3 Installments (1969) and American Archeology #1: Roosevelt Island (1994). She is also an accomplished filmmaker who has made a series of award-winning films including Ellis Island (1981) and her first feature, Book Of Days (1988), which was aired on PBS, shown at the New York Film Festival and selected for the Whitney Museum’s Biennial. Both films were released on DVD in February 2007. A retrospective art exhibition, Meredith Monk: Archeology of an Artist, opened at The New York Public Library for the Performing Arts at Lincoln Center in 1996. Other recent art exhibits are comprised of a major installation, Art Performs Life at The Walker Art Center, a show, Shrines at the Frederieke Taylor / TZ’ Art Gallery, inclusion in the 2002 Biennial at the Whitney Museum, ev+a 2002 Exhibition at Limerick City Gallery of Art and group exhibits Show People at Exit Art and Between Thought and Sound: Graphic Notation in Contemporary Music at The Kitchen. A monograph, Meredith Monk, edited by Deborah Jowitt was released by Johns Hopkins Press in 1997. In October 1999 Monk performed a Vocal Offering for His Holiness, the Dalai Lama as part of the World Festival of Sacred Music in Los Angeles. In July 2000 her music was honored by a three concert retrospective entitled Voice Travel as part of the Lincoln Center Festival. Monk’s first orchestra piece, Possible Sky (commissioned by Michael Tilson Thomas for the New World Symphony), premiered in April 2003 in Miami and was performed by the Hamburg Symphony in 2006. Stringsongs, her first composition for string quartet (commissioned by the Kronos Quartet) had its world premiere at the Barbican Center in January 2005. Recent projects include Basket Rondo for the Western Wind Vocal Ensemble, the Meredith Monk Piano Album published by Boosey & Hawkes, and a new CD, impermanence, on the ECM label.